When you need a common sense answer to your stockroom recycling problems, you need the M42BC stockroom baler. Harmony Enterprises has created a winning combination of strength and power, all put together in a stockroom baler that can fit into tight spaces. The M42BC Vertical Cardboard Baler is ideal for use in urban or confined areas where the operational footprint can be tight but the demands are large. Loaded with features and built to provide years of durable service in the harshest of environments, the M42BC increases your productivity and your bottom line. This innovative baler is a plug and play baler on casters. Its unique design allows it to roll under a standard doorway. The M42BC Vertical Cardboard Baler, another great idea from Harmony Enterprises. Read more about its success in delivery and use! Contact Us to learn more today! 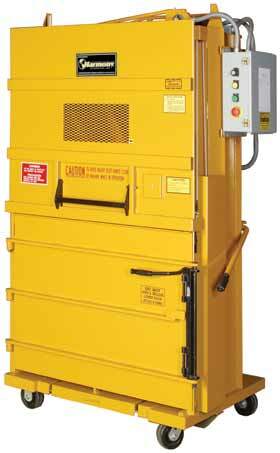 Need more information or pricing on the M42BC Vertical Stockroom Baler? Contact Us Today! Estimated Bale Weight: Corrugated: Up to 180 lbs.